Brokered messaging provides durable enterprise class messaging capabilities on the Windows Azure Service Bus. The brokered messaging capabilities were added to the Service Bus in September 2010, whilst the technology was under the name of AppFabric. The Service Bus provides queues that can be used for point-to-point messaging and topics and subscriptions that can be used for publish-subscribe messaging. Queuing technologies have traditionally been used to communicate messages between applications asynchronously. On the Microsoft platform MSMQ is a common choice as it is part of the Windows operating system. In cross platform scenarios IBM MQ Series is often chosen, as a queuing technology that can be used in a number of operating systems. 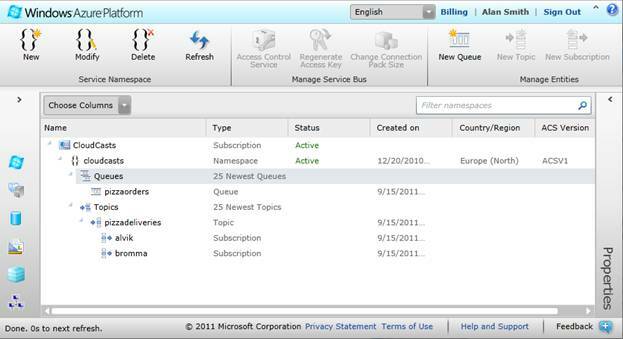 For integration scenarios BizTalk Server offers an enterprise class publish-subscribe messaging engine and integration with many line-of-business applications. The Windows Azure storage services also provide message queuing functionality that can be leveraged by cloud and on-premise applications. Service Bus brokered messaging provides enterprise class queuing functionality that can be used in cloud-based applications and also leveraged by on-premise applications. The messaging capabilities provide traditional queues based on the first in first out (FIFO) model based on queues, as well as a publish-subscribe model based on topics and subscriptions. The message service endpoints are exposed as REST endpoints, and .NET programming APIs are available for interacting with the queues directly as well as using WCF bindings to implement queued services.